Before he grew up and became one of Washington’s most respected reporters and editors, Andrew Ferguson was, of all things, a Lincoln buff — with the photos hung on his bedroom wall to prove it. Decades later, Ferguson’s latent buffdom is reignited. In Land of Lincoln , he embarks on a curiosity-fueled coast-to-coast journey through contemporary Lincoln Nation, encountering everything from hatred to adoration to opportunism and all manner of reaction in between. He attends a national conference of Lincoln impersonators; attends a leadership conference based on Lincoln’s “management style”; drags his family across the three-state-long and now defunct Lincoln Heritage Trail; and even manages to hold one of five original copies of the Gettysburg Address. Along the way he weaves in enough history to hook readers of presidential biographies and popular histories while providing the engaging voice and style of the best narrative journalism. This is an entertaining, unexpected, and big-hearted celebration of Lincoln and his enduring influence on the country he helped create. Okay, head's up, guys: I don't really like non-fiction. Unless it's about Disney World. Or Walt Disney. Or any other Disney-related thing. Alas, I'm in school and I have to read books there. This was the first read of the semester and holy crap, being a senior in college is tough. This is the first time in the history of my school career that I had to read an entire book in under a week. What was I thinking?! But I did it. I even finished it on time. Land of Lincoln is not a biography. It isn't even really about Lincoln. It's about the places that are about Abraham Lincoln. 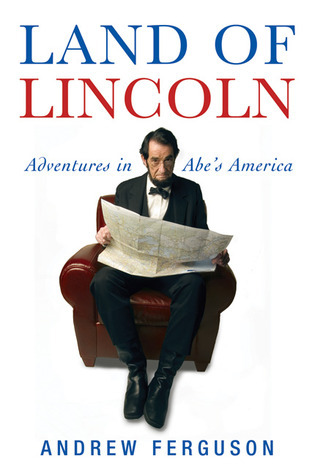 Throughout this book, Andrew Ferguson takes the reader on a journey around the different historical sites that Lincoln has inspired since his death. He interviews Lincoln enthusiasts and Lincoln "haters" alike, though it's clear which position he takes on the matter. I feel like I did learn a lot of things I didn't know before about Abraham Lincoln (this is school, after all). For example, I didn't realize Lincoln was not a die-hard abolitionist from the beginning. I learned about some locations I'd enjoy visiting, like the temple in Hodgenville that contains the "symbolic" cabin of Abe's birth or the Disneyfied Lincoln Library and Museum*. Unfortunately, there wasn't a lot of enjoyment to be found in this book - at least not for me. There was a lot of focus on various Lincoln conventions - from Lincoln impersonators (but they don't like to be called that) to Lincoln leadership workshops (yep, that's a thing). The last three chapters of Land of Lincoln were the best. Ferguson tells the story of his family's trip down the Lincoln Heritage Trail, which was actually a bit of fun. I enjoyed hearing from his kids and especially his daughter. I could totally identify with their dread on this long, historical trek. In the last chapter was a story of a concentration camp survivor who was inspired by Lincoln and was able to get to the tomb to pay his respects. I wish the book had contained more of these types of touching, personal accounts. My biggest issue with this book: On page 257 of the hardback edition, Ferguson does the unthinkable. He spells Disney World, Disneyworld. This is unforgiveable. To be fair, I was the wrong audience for this book. Still, I had to read it and so here we are. It wasn't terrible and I've most definitely read worse books during my (very long) time in college. I'd most definitely recommend it to any Lincoln buff. In fact, I'm loaning it to my dad tomorrow. *This museum looks epic. Unfortunately, it would seem that I am far less scholarly than the rest of my class because everyone else thinks it's dumbed down and cheesy. I think it's a fantastic way to get information to a new generation. Let's face it, a lot of people think museums are boring. I really believe that a lot of museums cater to a specific set of scholarly individuals and, while I enjoy learning, I am not one of them. I won't read everything on the walls, though I will walk around and try to look intelligent. As any Disney World junkie will tell you, the Disney company has a way of educating young people (and even not-so-young people) using unconventional methods. Universe of Energy teaches guests about, well, energy, while Spaceship Earth shows us the changes in technology since the time of the cavemen until the '80s, and The Hall of Presidents lets every average Joe hear from each of the presidents of the United States. Say what you will, this museum (and the Disney company) is onto something.